Smith is a multi-functional object intended to provide support for various activities in different areas of the home and office. 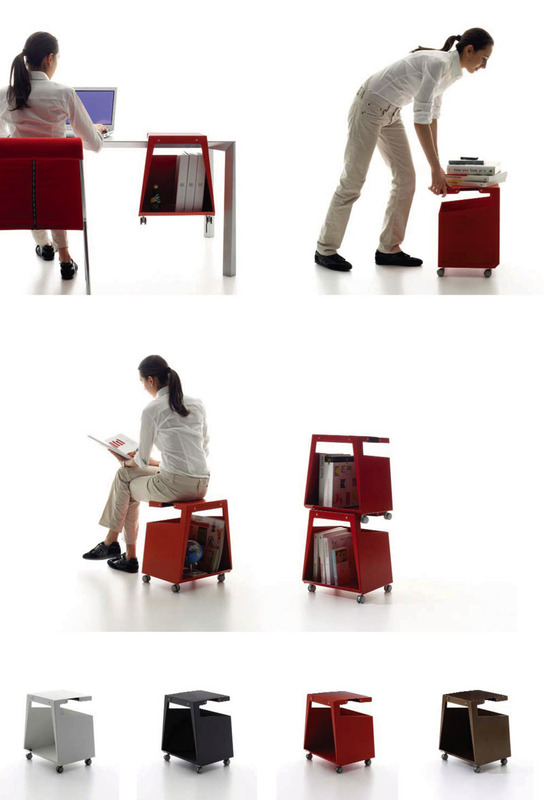 Smith's features provide seven distinct functions; a container providing space for storage, a cantilevered top allowing the object to be hung from a table, a flat upper surface serving as a side table or temporary seat, handles to facilitate moving, wheels for carting, and a protruding bottom that allows the wheels to hang over the sides when multiple Smiths are stacked. Smith's form is the result of a balanced ecology between these features and functions. This hybrid object is useful at a desk, a bedside, a sofa or a dining table and avoids classification into one specific typology. Ultimately it is the user who will come to define Smith through its use. Technical Description: bended sheet metal on casters. Size: 12.60" x 15.75" x 18.11"